DJ Peter has earned the reputation of always being on time and is a specialist in Durban Weddings and is a Birthday DJ, having done numerous birthdays over the years. 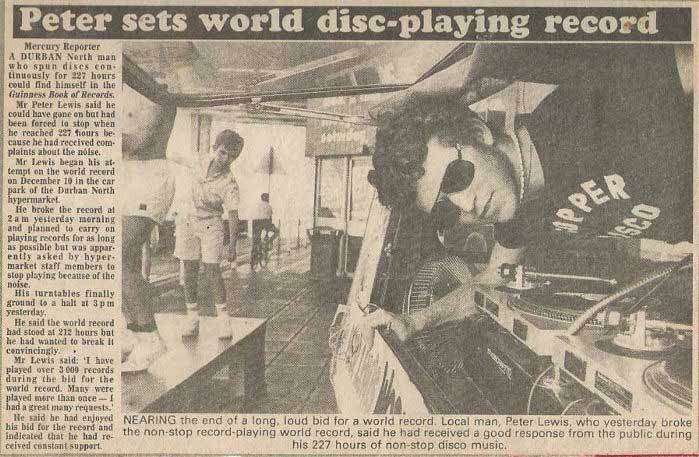 DJ Peter having broken the World endurance DJing record early on in his professional career, still continues to fill dance floors around the country. Peter started his career using standard tape decks and then progressed to Vinyl. Peter then mastered the use of CD Players during the early 2000's and more recently the use of the latest technology in Midi Controllers and TRAKTOR professional Disc Jockey software. which can cater for up to 500 people at Durban weddings and KZN other functions. Peter's extensive collection never fails requests made by clients at their functions. DJ Peter's Ultra Fast program can find a song from over 3 million tracks in less than 1 second. Having the songs info stored in a SQL Database gives the fastest way to find songs. We have also compiled a list of popular songs related to weddings and the different functions that we perform at. Here are the Top 200 most requested songs at weddings. We are both SAMRO and SAMPRA registered which gives us the right to perform and the right to play copyrighted music. With these licences we do not face the risk of having our equiment confiscated before or during an event by an inspector. Peter has played alongside all of the South African Radio Disc Jockey's that tour the circuit, and has provided some of the International Disc Jockey's with his experience in associated areas on a number of occations in Durban. Peter has the experience to play for ages from 7 years old up to 80 years old along with the music and lighting show to match. Not many Birthday DJ s will play for the younger crowd as it is very time consuming going through all the music and finding CLEAN versions of songs especially when the younger people enjoy Hip-Hop which is notorious of having vulgar language. Many Durban weddings have a wide range of age groups to play for and we are sucessful every time. , DJ Peter also produces his own remixes of tracks. DJ Peter has a large Video Library of Music videos from the 70's to the very latest for clients that wish to have a VJ (Video Disc Jockey ) Set. These music videos are remixed Disc jockey versions of all the popular songs and many of the more underground music. Karaoke is another service offered with Karaoke versions of songs with words on a screen, however Peter does not sing unless you get him really DRUNK. Peter has played in many clubs around Durban and South Africa, More recently Raffles, Origin, FTV, Eighties, Hops Riverside, Harveyz Hillcrest, Traxx, Backline, FunkyTown(JHB), Wonder Bar, Hops Ballito, Callies and Bostons. is most popular at weddings in that can do Graphics, text, Animations, Video and Patterns. In Fact, we do not know of any Club in South Africa that has this type of dancefloor. Many other Disc Jockey's do not advertise their fees for DJing, we have a page setup for our fees. We do not charge a premium for KZN Wedding DJ services. We treat KZN wedding DJ services just like any other function. The main factor that determines the cost for weddings and other functions are the amount of people and the duration of the wedding or event..